JaimeB Ok I was looking for John Deere colors. I ordered this and Holiday green taking a chance for the right color. To my suprise it matched perfect. iluvcrafts I bought the yellow crepe paper ribbon for my Christmas gifts. I am planning to use this color because it is almost the same color as the rooms in the house. I can't wait to use!! 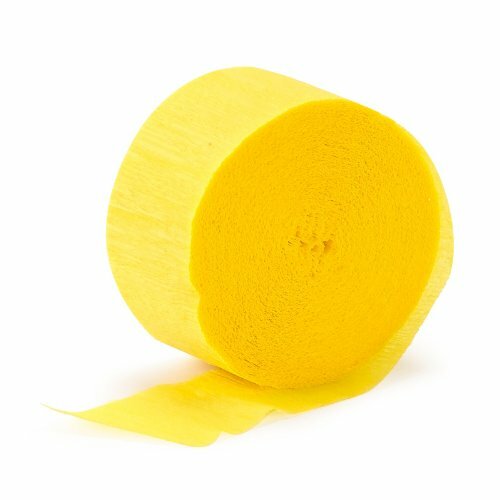 partyboss I bought 1 roll in this color and it was more than enough for the large space we had. It matched everything else perfectly! hawwah I bought 1 roll in this color and it was more than enough for the large space we had. It matched everything else perfectly! selinazac I only buy crepe paper via birthday express... high quality and matched the table ware Perfectly!! Zeez I found the picture is very true to the yellow colour.